Joel McHale was a guest judge this week on Fox’s new bonkers celebrity singing competition, The Masked Singer, alongside regular judge Ken Jeong — which resulted in a fun Community mini-reunion. certainly felt like I was on drugs by the episode’s end. This show is weird, you guys. And it is also addictive. The Masked Singer, on which cosplaying mystery celebs perform karaoke for regular judges Jeong, Jenny McCarthy, Nicole Scherzinger, and Robin Thicke plus exiled America’s Got Talent host Nick Cannon, basically resembles an hour-long version of Eurotrash band’s Alacazar’s infamous “Crying at the Discotheque” music video, and it has become such an unlikely ratings smash that Jeong is shocked. At the end of each episode, one contestant is unmasked — and the internet breaks. The show’s first episode had everyone in America indulging in the new national pastime of figuring out the famous faces behind the facades of the Peacock, Monster, Unicorn, Deer, and Lion, and this week those characters were back to keep us all guessing. This week also marked the second unmasking of an NFL star in the series’ first three weeks, following Antonio Brown’s big reveal as the Hippo on the season premiere. On Wednesday, the Deer sank his teeth and antlers into Florida Georgia Line’s “Get Your Shine On,” and when he got his mask off, he was revealed to be — as I’d guessed correctly — Super Bowl champion Terry Bradshaw. This one was a fairly cinchy guess. The Deer had dropped clues about the “wild West” (Bradshaw has sung country & western music semi-professionally before), a love of horses (Bradshaw breeds quarter horses), doing tons of commercials, winning multiple titles, ans “making a donkey of himself” (Bradshaw owns a pet donkey! ), so it all led to a perfect Masked Singer touchdown. Let’s look at this week’s four other returning mystery singers! Clues: Along with episode one’s clues about the Lion coming from a “pride of women” and “Hollywood royalty,” this week she was seen reading a newspaper proclaiming, “Gold Found in Hailey, Idaho!” She also told the judges, “I have no gold or platinum hanging on my walls” when Jenny McCarthy asked if she had any hit records to her credit, so that rules out people like Lady Gaga, Christina Aguilera, or Ariana Grande ––even though the Lion’s roar on Nina Simone’s brash classic was nearly Gaga/Xtina/Grande-level. Judges’ guesses: Hailey Baldwin, Kelly Rowland, Emily Blunt. The judges are dumb. My guess: I admit my previous prediction, Aubrey O’Day, was a total shot in the dark and as dumb as any of the judges’ guess. The hive-mind on Twitter has insisted ever since that the Lion is actually Rumer Willis, who has performed on another hit Fox musical series, Empire. Rumor has it that it’s Rumer! (See what I did there?) The Lion does sound like her, but this week’s key clue was that Hailey headline — Rumer’s famous Hollywood mom, Demi Moore, has a house in that small Idaho town. So Rumer is my final answer. 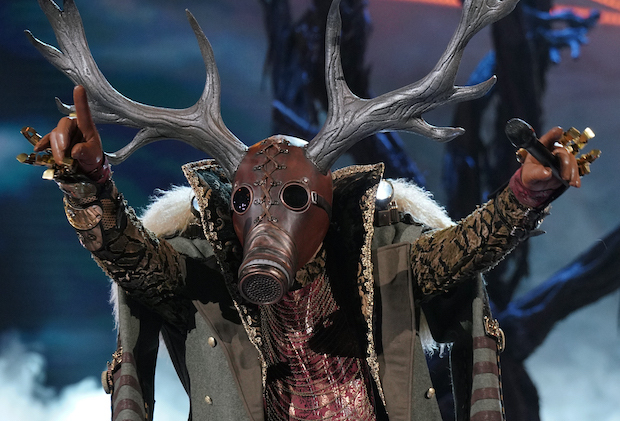 Clues: The Peacock said being on the Masked Singer stage made him feel like he was “5 years old again,” said he “started out as a little teenybopper, and said has gone through “different incarnations of his career” That didn’t offer much beyond his previous clues, but he did confirm that he has performed in Las Vegas and casted in dramatic acting roles. Judges’ guesses: Neil Patrick Harris, Criss Angel, David Copperfield, David Hasslehoff, Tom Jones. But Garrett has been acted in dramas (he was outstanding in The Outsiders), and his gruff OneRepublic cover didn’t sounded like Donny until the big finish. It was morethan a little bit rock ‘n’ roll! So, now my top guess is Leif, who did star in a 2006 Vegas revue called “Original Idols Live!” with Barry “Greg Brady” Williams, the Bay City Rollers, the Cowsills, Tony DeFranco, and Danny Bonaduce. (Damn. How did I miss that?) But it could also be drama king/frequent feather-ruffler Corey Feldman. The Peacock performed on a 30-foot hydraulic lift in a mask (despite having a fear of heights), and that seems like the sort of stunt Corey would do. And Corey has played Vegas too. Judges’ guesses: Denise Richards, Gabby Douglas, Mary Lou Retton, Aly Raisman, McKayla Maroney. The judges were really fixated on those “gold” and “gymnast” clues. My guess: Last time, I guessed Tori Spelling. Every single clue lined up, so much so that I was ready to throw the Unicorn’s Masked Singer victory party at the Peach Pit After Dark. The “victorious” line might still be a pun on Tori’s name, and “Beverly Hills” a reference to 90210. But Denise definitely “lost her Sheen,” is a former model and Real Housewives of Beverly Hills cast member, and was pretty gymnastic in that Wild Things three-way scene. And who could blame her for having a fear of singing in public after her terrible “Take Me Out to the Ballgame” performance went viral? The Unicorn’s Britney tone-deaf cover this week was pretty oops-worthy, so Richards is my new guess. Clues: This bottle-poppin’ party dude from the South dropped some vague baseball references, but his song choice was the biggest clue of all. Judges’ guesses: Jamie Foxx, Derek Jeter. My guesses: During premiere week, I guessed this reclusive furry hip-hopper was 50 Cent nemesis/disgraced Fyre Festival promoter Ja Rule. But after heeding fans’ nearly unanimous guesses and listening to T-Pain’s actually excellent and totally AutoTune-free NPR Tiny Desk concert, I was convinced the Monster is T-Pain. And the real clincher was the Gavin DeGraw song that the Monster sang this week.